So, yesterday was interesting! Fantastic, brilliant, a downright scary drive home, and many other emotions can be pitched in to yesterday’s day. But what a great day it was, and one that I won’t forget for a while. So, what happened? Firstly, a little revelation. Before yesterday, I had, despite being a fan of motor sport for 15 years, never been to a motor race. Considering I run a motor sport related blog, that might come across as surprising! The reasoning behind that is because no one I’m related to is really a motor sport ‘nut’ like myself, and I’d never really found the opportunity to ask any friends (partially because I’d have no clue as to whether they’d be interested – there are a few motor sport nuts, but I’d never pluck up the courage to ask, or vice versa – anyway). I was planning another usual weekend, watch the F1 and stay in, no doubt following the football in the afternoon. That changed on Saturday when a friend asked if I wanted to go along with him to Silverstone the next day for round one of the FIA World Endurance Championship. Hell yes! A no brainer for me, and clearly for the 43,000 others that went to Silverstone too on Sunday. At £40.00 a ticket, I work that out at about £1.7 million worth of ticket sales that Silverstone made for race day. You can’t complain about the ticket price: six and a half hours of racing, paddock access, a pit lane walk, free roaming around the track, what more could you want? The only thing that saddens me is that Silverstone can have the F1 race day prices in excess of £100, yet sell over 100,000 tickets. But we should take the 43,000 figure as a positive, and hopefully that goes up in years’ to come, it deserves to. 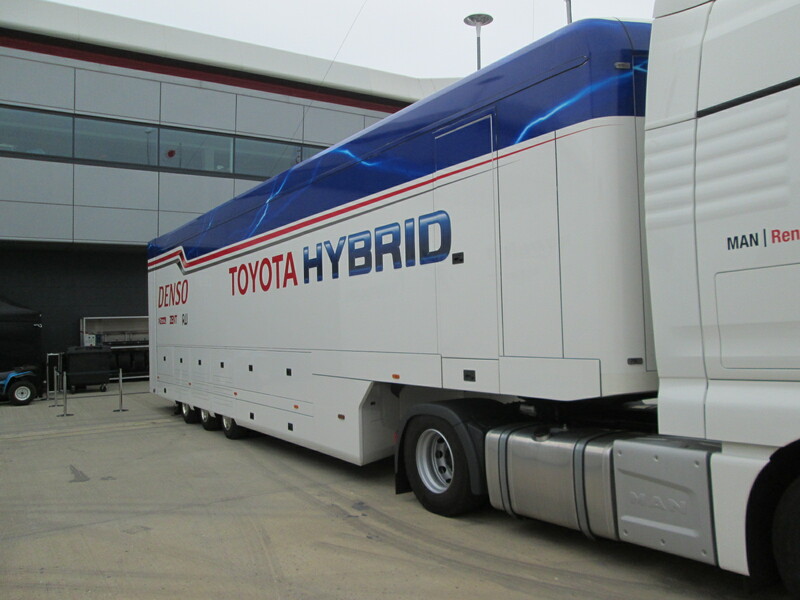 A shot of the Toyota motor home in the Silverstone paddock – Round 1 of the 2014 FIA World Endurance Championship. 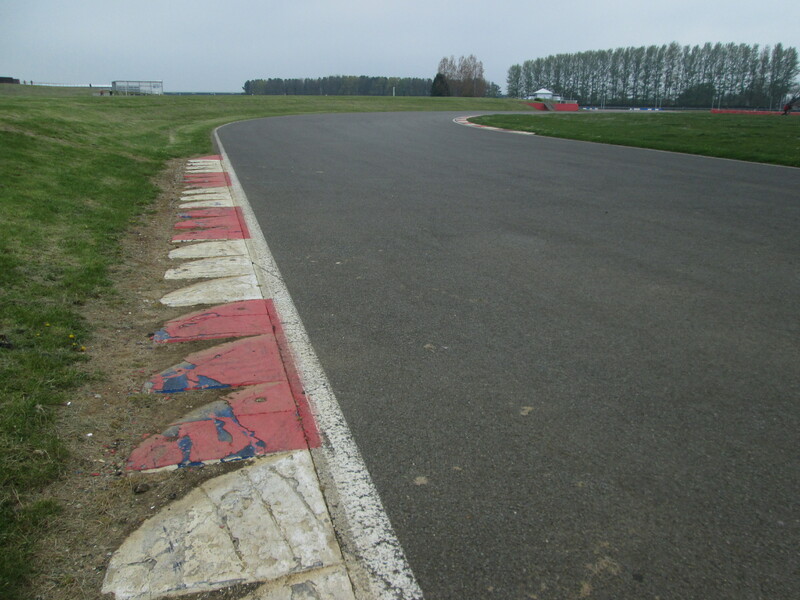 We positioned ourselves in the Becketts complex for the start of the main showpiece race, which was great for many different reasons, notably the fact that we could see the majority of the circuit: Copse through to Stowe almost, and the new first section. We stayed there for the first hour and beyond, as the heavens opened it made for interesting reading as the Toyota and Audi’s duelled it out, along with a minor annoyance. The tarmac run off areas. As the drizzle began, many drivers’ took the liberty of going straight on at the second part of Becketts, without an attempt of turning in. Just a minor bugbear worth mentioning. Being a ‘newbie’ in going to races, the main point of interest to me was the sound. From the grandstand, most of the cars, from LMP1 down to the GTE-A class sounded fairly similar, however the difference was clear from track side between Becketts and Copse. I’d been reliably informed to keep an eye sound of the Audi’s. Boy was it different! Distinct, and stood out a mile when down at track side. Each lap, as one by one the cars went by, the Audi was noticeable. I liked it, personally. Overall, in the ‘how loud is loud’ argument, the sound yesterday was very, very loud! As this was my first motor race, there was no comparison for me, but in any case, it definitely felt loud. Schumacher and Hill colliding, and many more moments have taken place over the years here, no longer in use and untouched. After lunch, we moved round to Luffield. One of the brilliant things about yesterday was being able to position myself wherever I wanted, which, as it is a motor race, I wanted to experience. I don’t want to go to a motor race and sit in one position, I want to go and experience it from many different angles, different corners. I think it also makes you appreciate more the amount of effort that goes into preparing race weekends up and down the country, week in and week out, that makes race day what it is. It was the little things like that which made the day for me, being able to stand at Luffield, stand at Copse, both in the wet and dry, the same corners that I have seen legends race through year in, year out on TV. That’s what I found great. Then, we came across Bridge. A piece of history, but no longer in use, which saddened me. I’m surprised it hasn’t been utilised in some way, at least yesterday, the grass in that section looked long and untouched in quite a while. The day ended back on the start finish straight as the 6 Hours of Silverstone prematurely came to an end. It was the right decision to call off the race. To be honest, the Safety Car decision confused me, however the weather in the twenty minutes following rapidly got worse. I’ve criticised some decisions concerning red flags in the past, however, actually having an attended a motor race as a fan now, I understand definitely the decisions from a ‘fan in attendance’ perspective. Getting out of Silverstone was a nightmare, but beyond their control. Had the weather been nice, no doubt some would have stayed for the podium presentation, thus, a more controlled traffic flow. Had the race continued until 18:00, the journey home would have been even more worse yesterday. I avoided the M1 as I was worried about the spray at 70mph, but the A5 was just as bad: multiple rivers, and many, many scary moments! In any case, a Toyota 1-2 and Porsche in third meant that we went home happy. But, what a day. What an experience. From start to finish, it was full of great memories and moments that will last a while! I think it is fair to say it had everything a fan could wish for with great racing, great access and even typical British weather so that fans can experience the cars in all weather! If you’re ever asked to make a decision in the future: watch F1 on TV, or watch racing in the flesh at your local circuit. Choose the latter. It’s a decision you won’t regret. Sounds like you had a cracking day. 1 race I’d recommend you go to is the Le Mans 24hrs (been plenty of times, albeit not in recent years). It’s pretty cheap for general admission (last time I went it was about 60 euros for the weekend for general admission). However, Le Mans is almost more about the weekend with friends than the racing, eg bbq’s, a few drinks, having a laugh, going to different areas of the track. It’s certainly not a race you should go to just for the race, you need to go with a good group of friends and be there a few days and just enjoy yourself when you’re at the track as well as when you’re not at the track. Anyway, great that you had a good day. Hi there Stevvy! I’m going to the 24 Hours of Le Mans this year and I’m just wondering if you would be allowed into the paddock at all during the weekend. I will be there from Monday evening. Brilliant article. Can feel your excitement! You sound like I did after my first F1 race at Spa in 2010. Great read as ever, glad you enjoyed your day. M1 was crazy, I didn’t even touch 70, imagine racing in that! A great article and your enthusiasm for the day really comes through. Great value for the event. I attend the GP each year and take one of my 2 sons, (alternating to prevent arguments !). This year I’ve downgraded the grandstand seats for the GP – and the savings enabled me to spend Saturday & Sunday at the Silverstone 6 hours with both boys, including food, overnight accommodation and return travel from the North East. Access within the track (to paddock,etc) was beyond anything I’ve been able to enjoy in almost 30 years of attending races at Silverstone (boys got autographs from Wurz / Nakajima / Sarazzin / Heidfeld / Leimer / Prost) and the track organisation with operating out of both sets of pits on Saturday ( ELMS cars were housed in the National pit garages) was really slick. Shuttle Buses also working really well. This sort of access is also commonplace at local circuits (mine is Croft) and I can endorse your recommendation to “go racing”. Next up for the WEC is Spa 6 hours and then Le Mans. Both events on a “to do” list now ! Glad you enjoyed your first race.next time try one abroad say f1 Belgian gp.i have done a few gps around the world and several lemans.i recommend it.but go with a specialist travel company. That do this kind of thing.go and enjoy it. i watched the fia wec on tv at home. was tempted to go as it is a good price. i think a 3 day pass was around £45 quid!!!!. I am not overly fond of btcc. since super tourer era they have suffered with success ballast and more silly tyre rules’. seems very Mario cart style. Hi Joshua 🙂 I can’t speak for the last few years but I do know that even general admission tickets when I last went (around 2007) allowed you access to the pitlane. Can’t remember about the paddock, but the pitlane (during set times, obviously) you can go in. Enjoy yourself!